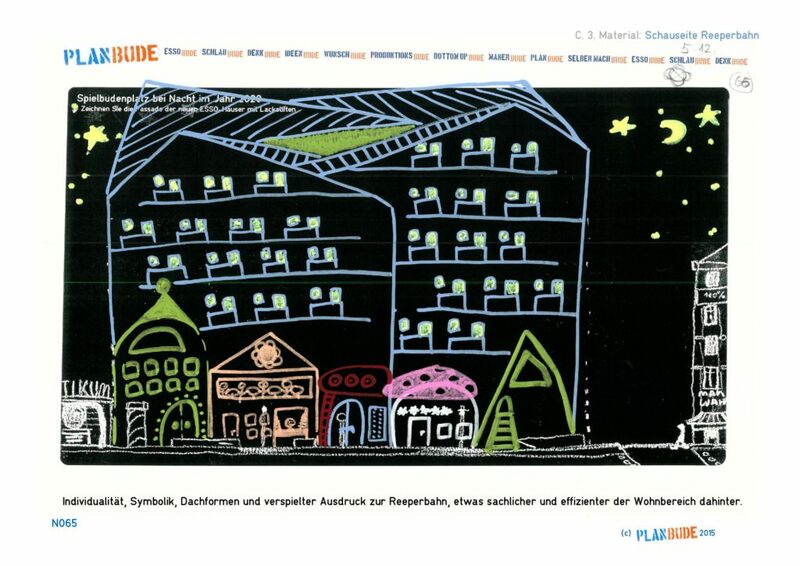 PlanBude is a transdisciplinary office, organizing the planning and participation for a 28.000 square meters ensemble of houses in place of the former Esso-Houses on Reeperbahn, St. Pauli, Hamburg. 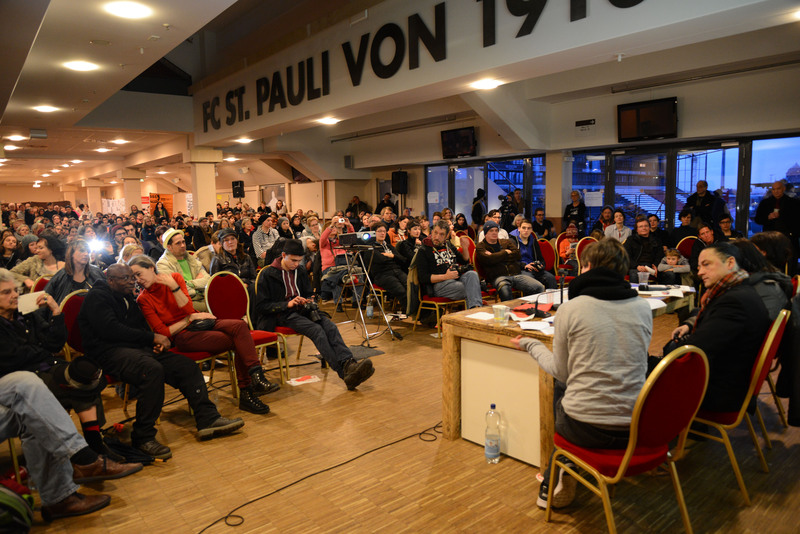 The PlanBude idea was kicked off by an independent citizen’s assembly in the Ballroom of FC St. Pauli. The team of six combines planners, artists, architects, cultural scientists, DJs and community workers. PlanBude now works commissioned by the planning authority. 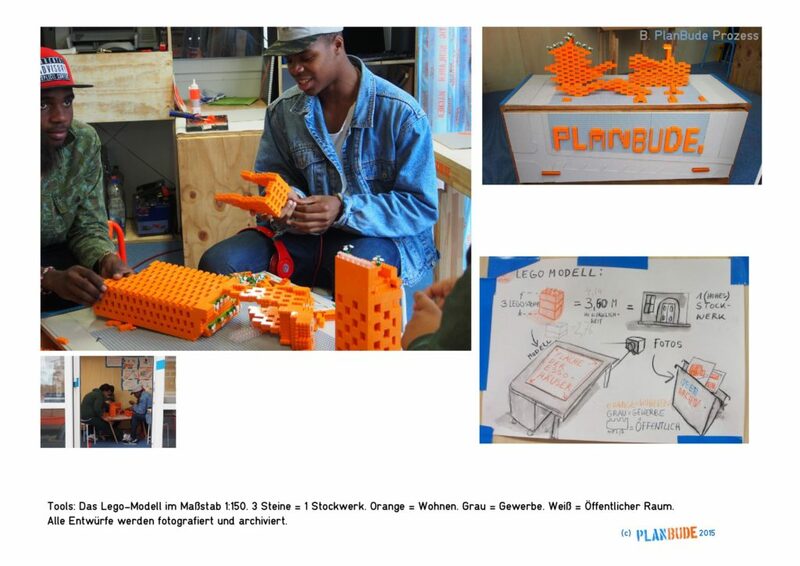 In a unique planning process, PlanBude opened it’s doors right at the construction site in the heart of St. Pauli, offered innovative tools that allow complex contributions by everybody. 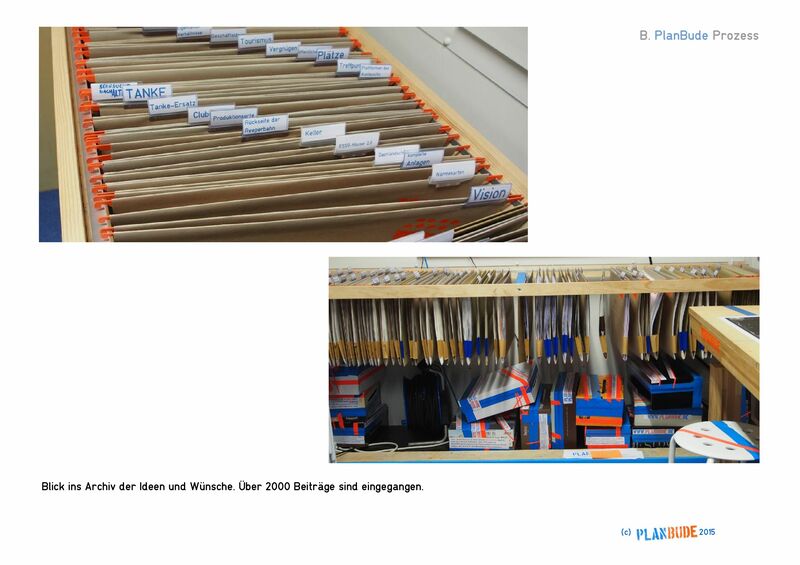 PlanBude collected 2.300 wishes and designs, in an open brief process. Eventually, politics, planning authorities, and the private owners agreed to accept the PlanBude-developed “St. Pauli Code” from the neighbourhood as a briefing for the architectural competition. 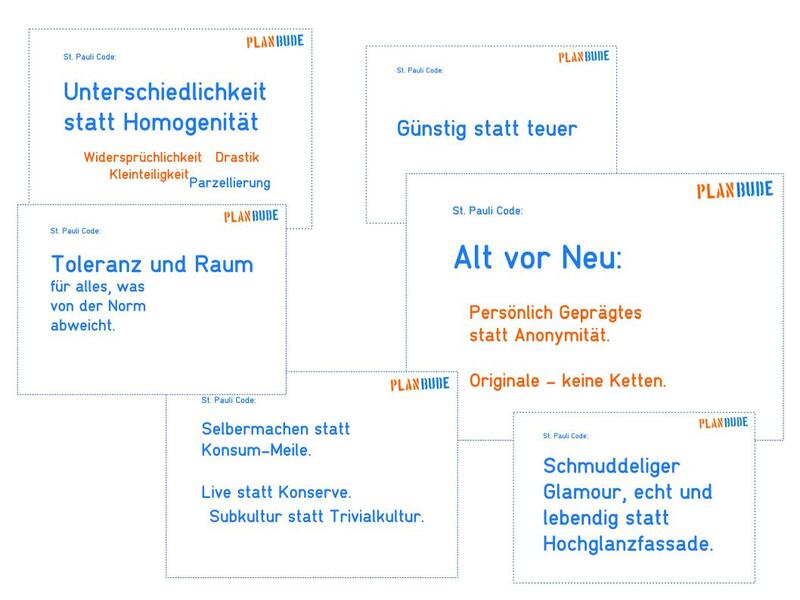 PlanBude now works on the realisation of the “St. Pauli Code” with the winning teams of NL-architects (Amsterdam), BeL (Cologne), IFAU/Jesko Fezer (Berlin), Lacaton & Vassal (Paris) and feld72 (Vienna). Scroll down for more information on. PlanBude (planning shack) collects ideas, analysis, opinions and plans for a central new building complex in St. Pauli, the ESSO-Häuser-Area (named after a popular petrol station with 24/7 shop) at Spielbudenplatz. 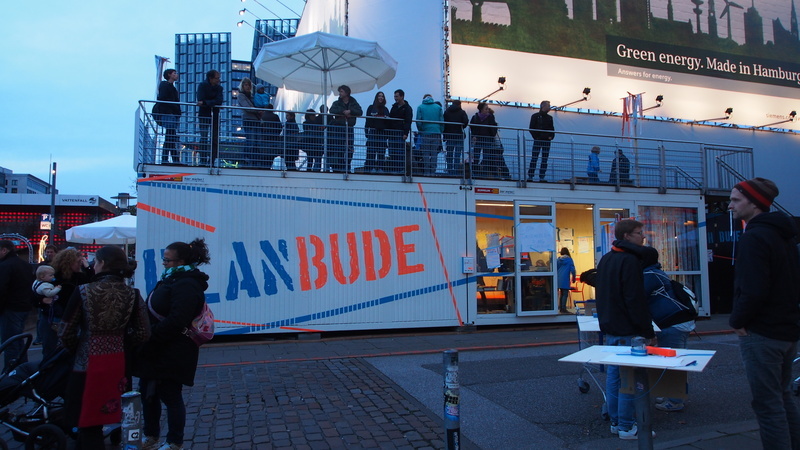 In two containers, placed right at the construction site, PlanBude offers a wide range of planning-tools, to allow all neighbours to get involved with the planning process. 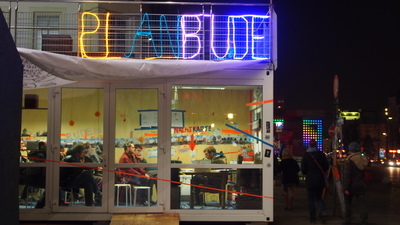 PlanBude is a trans-disciplinary team combining knowledge and practice from the fields of art, architecture, urban theory, cultural science, DJing, activism, social work, community organizing and planning. PlanBude is commissioned by the local administration, the District Hamburg-Central. 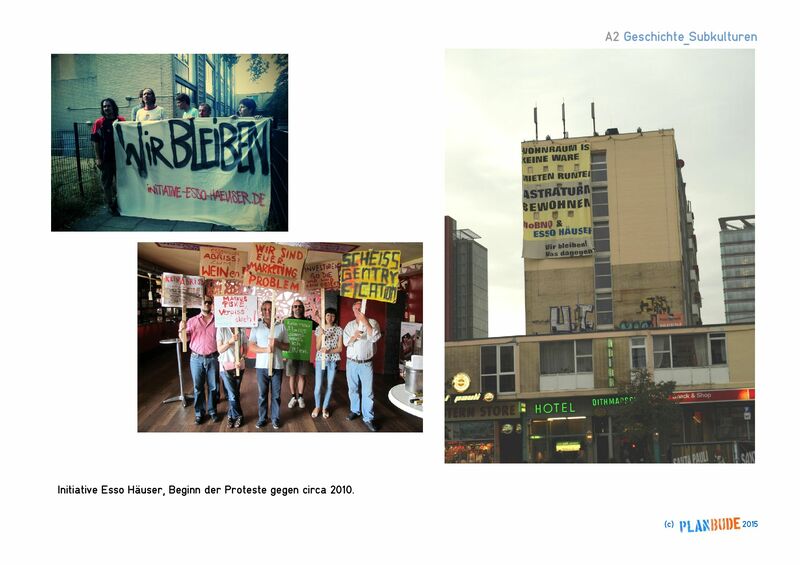 But it is also a product of the rich landscape of protest and self-organized right-to-the-city-movements of St. Pauli: In 2010, the so called Esso-Houses were bought by a big investor, the Bayerische Hausbau. Tennants struggled for years to keep their flats, founded the Initiative-Esso-Häuser-wir-sind-kein-Objekt („Esso-Houses – we are not an object“) supported by neighborhood initiatives like SOS-St. Pauli, by the film makers of the movie „Buy Buy St. Pauli“, and by the Megafonchor. But in 2013 the houses were declared to be „in danger of collapsing“ by a team of experts/engineers. Shortly before christmas, the houses were suddenly evacuated and cleared. The inhabitants got support from the neighbourhood. 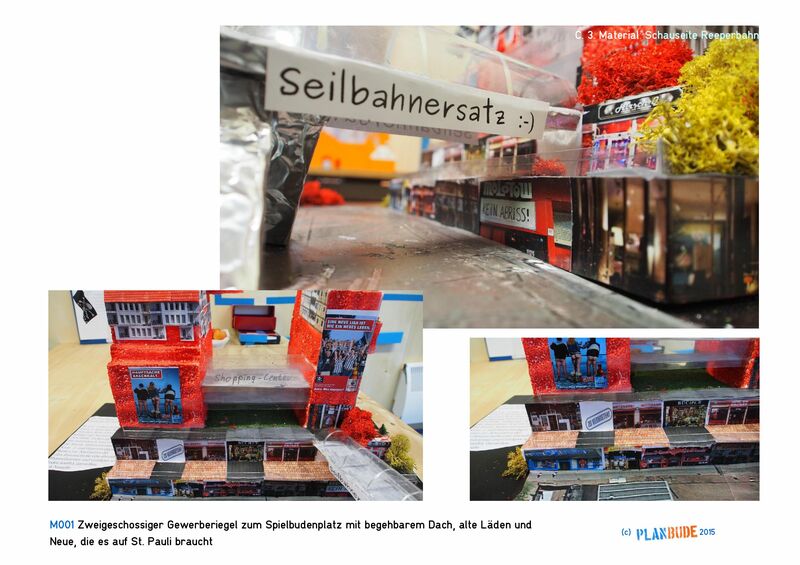 Protests took to the streets, and an independent community meeting in the Ball Room of FC St. Pauli demanded: We want to take the planning into our own hands. Easier said than done, neighbours founded a planning committee, wrote a concept – and negotiations began with the district mayor and with the department for building. Finally the administration and local parliament agreed – and the freshly founded PlanBude was commissioned to organize the planning process: Independent, open-brief, in the community, before anything is decided by authorities and owner. PlanBude’s aim is the organisation of a credible process. Thus, the team developed a new concept and innovative planning methods: plasticine models in scale 1:500, a LEGO-model scaled 1:150, fotoresearch, soundwalks, doorstep interviews, seminars with the local school, inspirational readings, events and questionaires for all households in the community. Nearly all team-members live in St. Pauli, with expertise in the fields of art, planning, social work, pop-music and cultural theory. 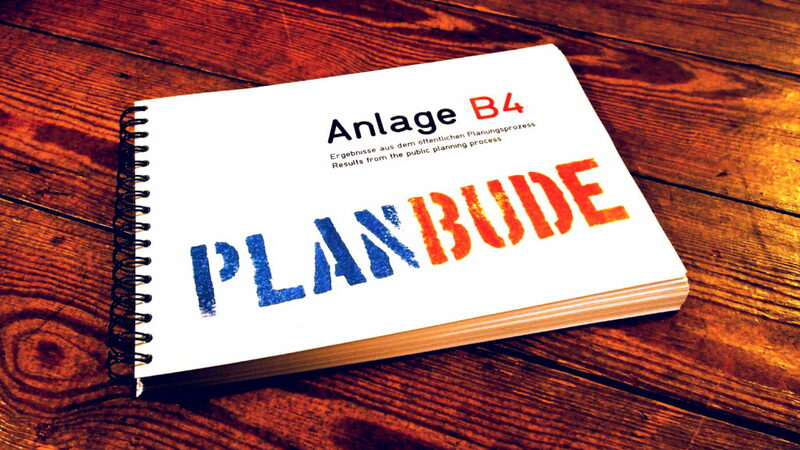 PlanBude developed planning tools vor everybody: inviting, playful, innovative and artistic. Even for professionals it is not easy to imagine what a gross floor area of 24.000 sqm (78.000 square feet) means. 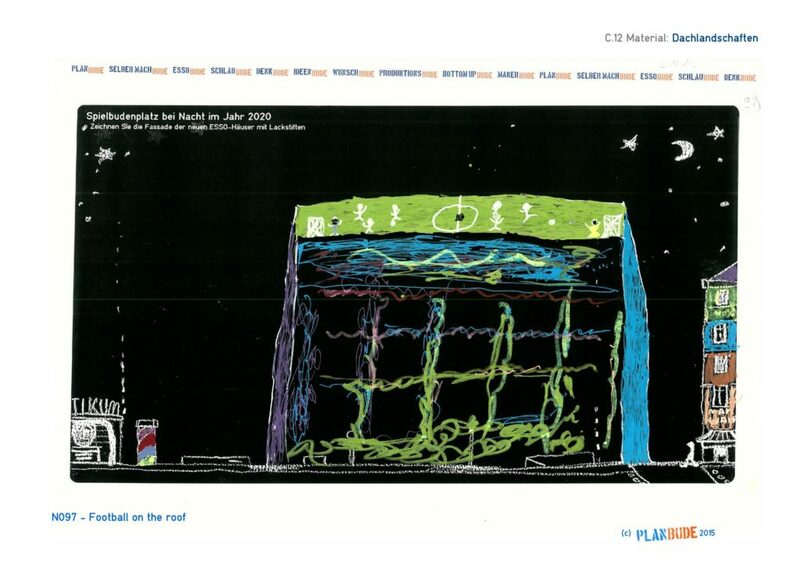 In a study, the city had found this to be the ideal volume for a new building. 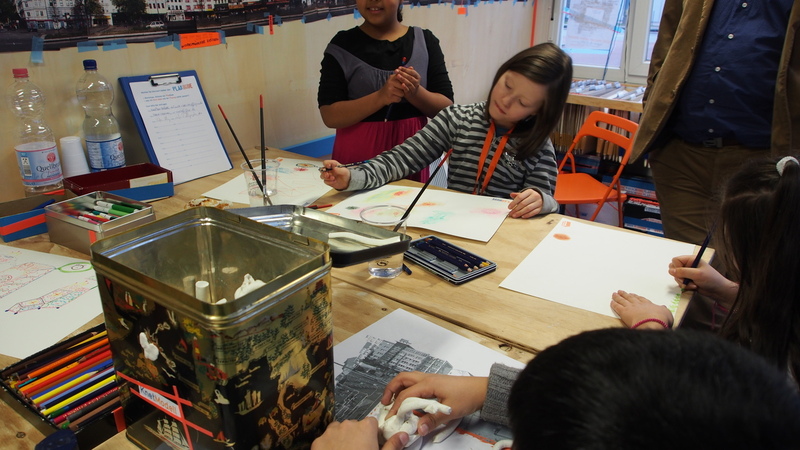 We tested and calculated, that 78.000 square feet equal 1.3 kg / 46 oz of plasticine in the scale 1 to 500 – handed visitors a lump of clay and a rubber map, and everybody could easily design, what is possible in the area. The „Plasticine Model“ – 1,4 Kilos of plasticine roughly equal 24.000 square meters of building in scale 1:500. The „Night Card“ asks for a view of the houses in the year 2020. 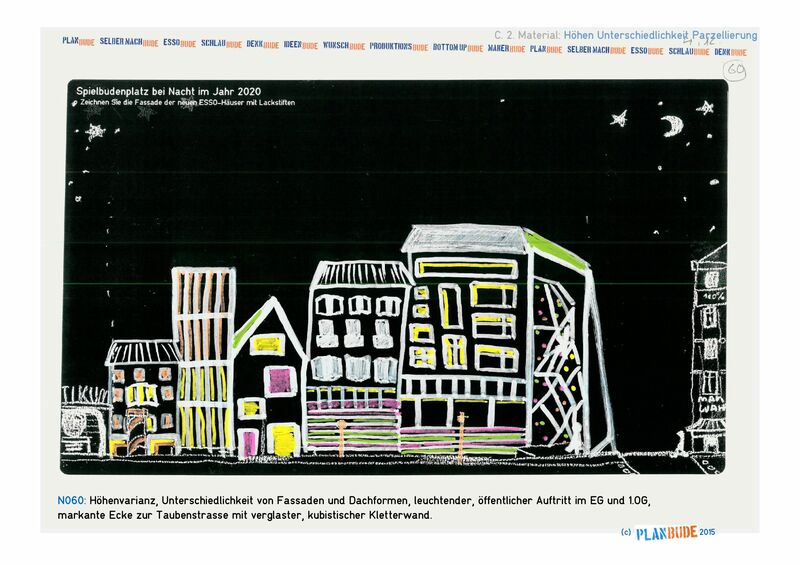 Chique markers inspire people to draw, who didn’t do this since school… And besides statements about a glamorous neon look, the „Night-Card“ also clearly revealed the wish for „houses“ not „complexes“, difference – and, surprisingly clear – for usable rooftops! Top: Added together, the stick-board tool shows, where people would like the noise to be, where they would like to meet and chat with neighbours, and where there should be silence. Of course, for many interesting results, people invented their own „tools“. „Tourist Sponge“: „Milking“ the Euros on the Reeperbahn to subsidize housing in the back. A multitude of different people came to express their wishes for the new houses. 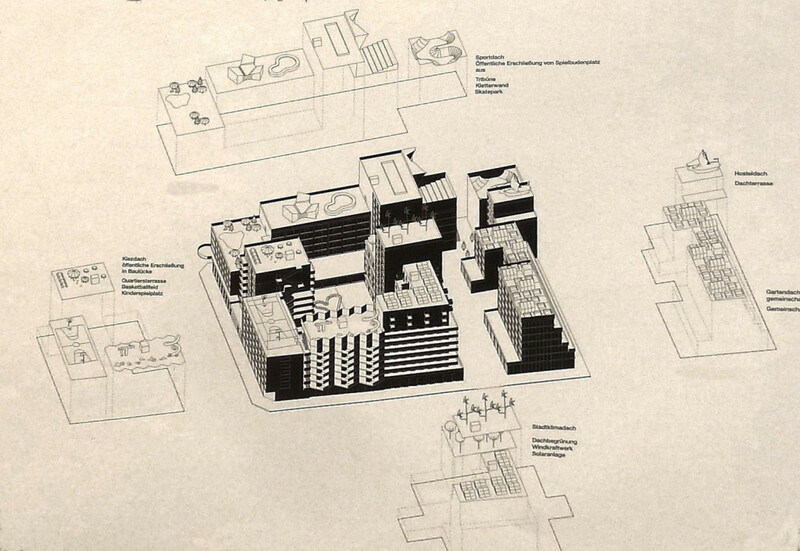 With 2.300 contributions (designs, statements, drawings, models…) the response was overwhelming. The results were compiled and presented to a community conference – and negotiated with the state and the owners only after the local public had agreed upon this. The local knowledge provided the briefing for the architects. Can St. Pauli be saved? 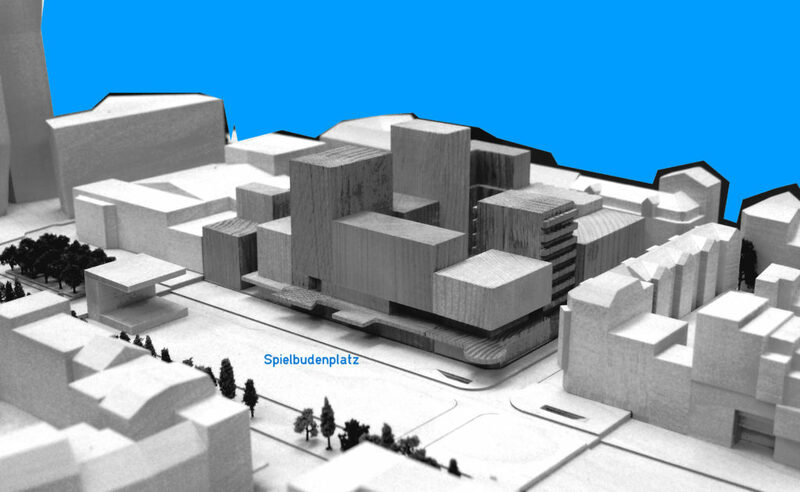 Is it possible to built a new quarter, where the „Logic of St. Pauli“ can be continued? 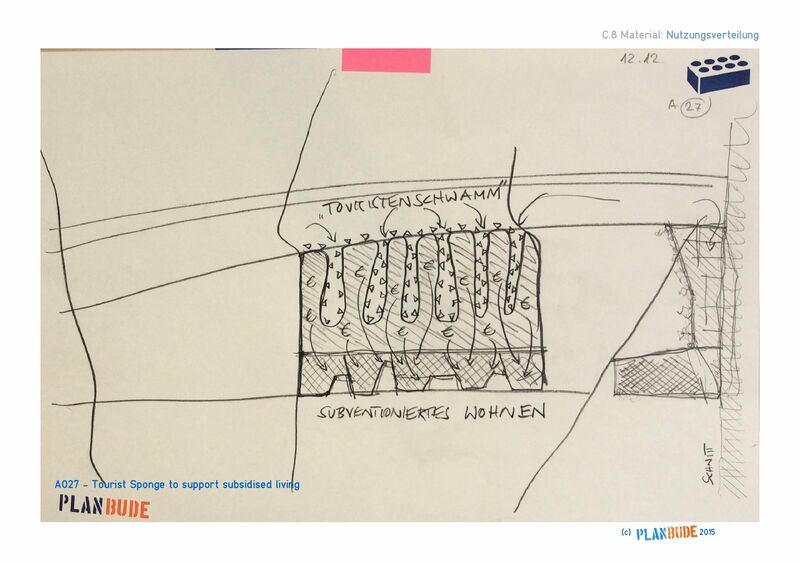 The conflicting parties came to an agreement in May 2014: The briefing for the architectural competition follows the results of PlanBude’s research. 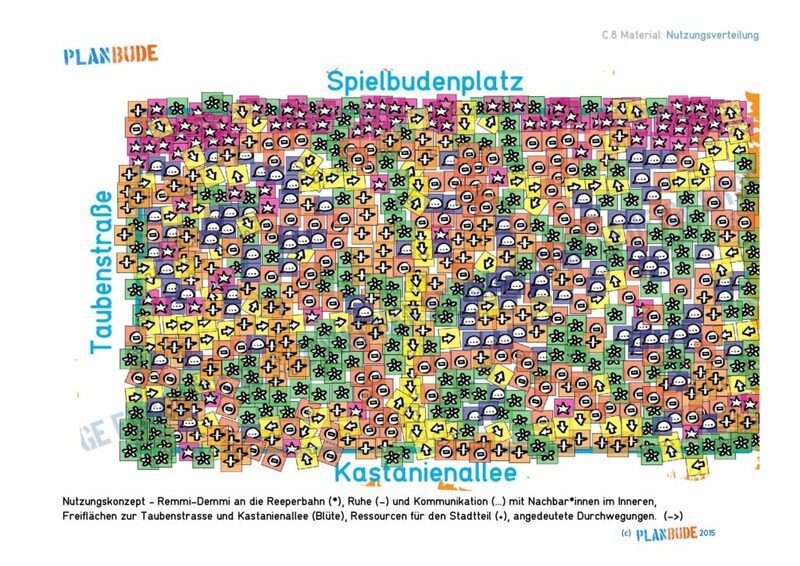 The results are social – and exciting: 40% social housing; 20% coop experimental housing; 40% rentable flats; no condos; a neighbourhood and subculture cluster; some public roofs for basketball, leisure, kids, skateboarding, a climbable skyscraper wall, no shopping chains; towards Reeperbahn, smaller spaces for St. Pauli style business; a public balcony; return of Molotow-Club. 0% (no!) privately owned appartments or „condos“. On top of this: 2530 qm will be reserved for the return of subcultural institutions like the Molotow-Live-Music-Club, and for neighbourhood oriented, social and cultural purposes: The FabLab St. Pauli, a Community Canteen, the Rock‘ n Roll Hotel Kogge, and other functions for the common good. On all ground levels there will be shops or places accessible for the general public – we call it the „Urban Socle“. Towards the Reeperbahn there will be even 3 storeys of accessible places, in the basement, the ground floor and the first floor, connected by a public balcony towards the Spielbudenplatz. This thick layering of functions is a way to allow a high density of differences, with as many entrances, lifts and staircases as possible, leading to public or more secret places. From the second level upwards, the owners will build a 6000 square meter Hotel which also operates as a sound barrier for the approx. 14.800 square meters of housing. Already, PlanBude is a much discussed model, how a credible process can lead to more interesting results than top down administrative or private planning. St. Pauli, once again, in the lead: this time in the field of democratic urban development. In Summer 2015, the urban design contest has been decided – and the Winner is NL-Architects (Amsterdam) and BeL-Architects (Cologne). The Design by teams is a precise translation of the results from the PlanBude process – adding the programmatic and conceptual class and bite, that one wishes for. The jury voted with 17:0 for the winning design, including the vote of professionals, the owners, the community, the administration and the political representatives. 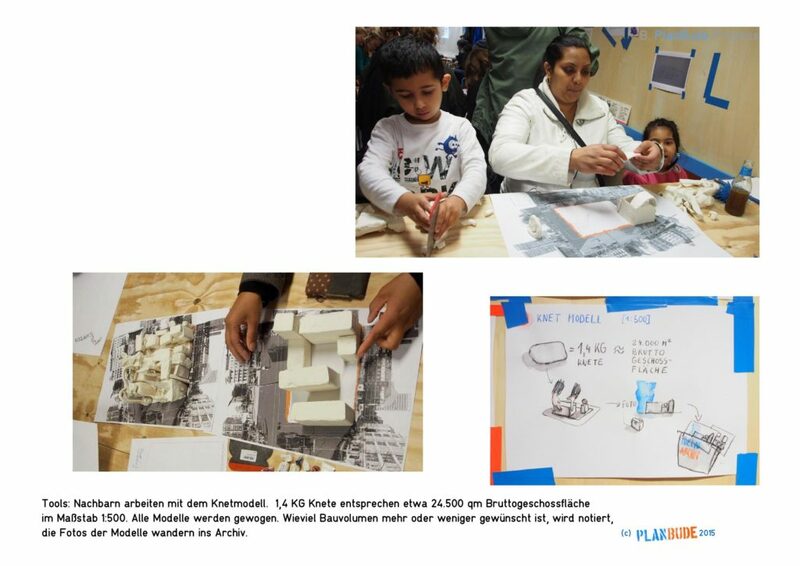 Please watch a talk on PlanBude by Planbuddies Christoph Schäfer and Renée Tribble with English Voice-Over translation at the project bauhaus forum at Haus der Kulturen der Welt: Desiring-Production – Can Design Change Society?